That's Cool, That's Trash! : The WILD GUITAR riff is finally here! The WILD GUITAR riff is finally here! Regular listeners to the podcast well know the long story of our riffing of Arch Hall, Jr.'s, Wild Guitar. We typically do a bit of pre-writing and then get together to record a movie riff in a day and half. It's a good excuse to hang with some old friends and crack-wise. We started the Wild Guitar riff in February of 2015! There were some problems with it and Joe and I pecked away at it whenever we had a free couple of hours. While there were no nervous breakdowns, it's safe to say that this is our equivalent of Brian Wilson's SMiLE album. Even after we finished it, I shelved it, trying to come up with a good way to sell it, since Rifftrax doesn't sell 3rd-party riffs anymore. Joe said we should just throw it up on YouTube so people at least get to see it, but the Arch Hall & the Archers music would make all viewing money go to Arch Hall, Jr. I looked him up and found him to be a really big Trump supporter. I was not into that. Then it hit me: what if we gave the riff away as a thank-you gift to people who donated money to charities that are working to undo the damage the current administration is doing? As a result, I'm pleased to offer this riff and hope to give away as many as possible. The money's never important to us and I hope Arch Hall, Jr., learns that his movie is helping fight Trump & Company. 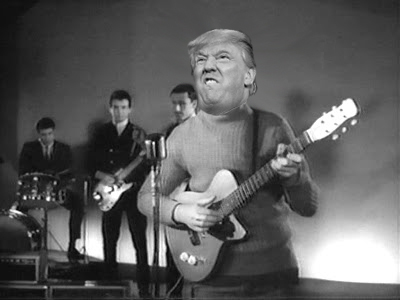 You just know that would be his guitar-face. Some friends in our inner circle have seen Wild Guitar and many have said it's our best one yet! So, how do you get in on this deal? It's simple. Donate at least $4 U.S. to one of the charities listed HERE and either A) take a screen shot of your donation confirmation or B) send us photo proof of your gift and we'll send you a download link to hilarity. You can post it in the comments here or on our Twitter account (@thats_trash) and provide us a means to send you a link (email, Twitter, etc.) and, BINGO, you're in. Additionally, we're offering our first 3 movies for the same deal. We've done Bloody Pit of Horror, Invasion of the Bee Girls, and Curse of the Swamp Creature. Each donation of $4 dollars will earn you another riff...or become a super donor and get all for $15. We've already got some donations in! The Southern Poverty Law Center, Human Rights Campaign, and Charity: Water have all received donations on behalf of TCTT! Thank you! Keep the donations coming! Another donation, this one was to the People for the American Way, from our friends as Rogue Riffers!!! Thanks, guys! We're getting some glowing reviews, folks. Check it out. We got a super donor who earned all 4 TCTT movie riffs by giving to the ACLU! Thanks!